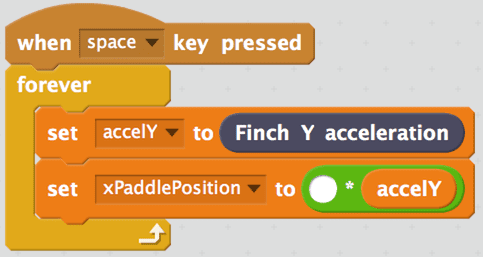 The sensor blocks for the Finch are at the bottom of the More Blocks menu in Scratch. For example, the Finch left light and the Finch right light blocks can be used to measure the values of the two light sensors. Each of these blocks has a value from 0 (no light) to 100 (maximum light). Drag a light sensor block into the Scripts area. 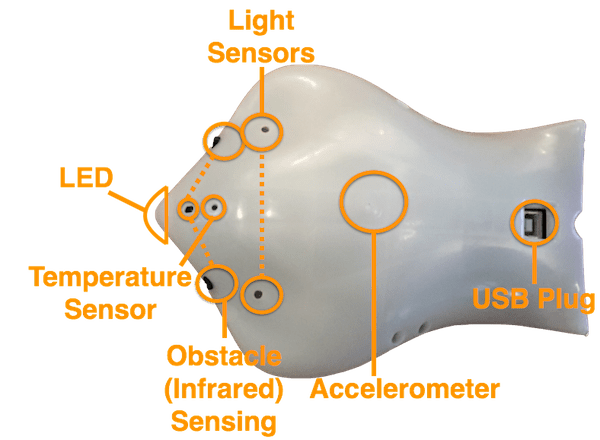 Click on the block to see the current value of the sensor. Next, cover the light sensor with your hand and click on the block again. You should see the value of the light sensor change. What is the value of the block when you shine a flashlight on the sensor? The New Variable window will appear. Call the variable “left light” and click OK. There is also a Finch block that can be used for measuring temperature in Celsius. Create a variable named “temperature” that is equal to the value of the temperature sensor. What is the temperature in your room? Can you raise the temperature reading of the sensor? But what if you want to know the temperature in Fahrenheit instead? You can use this formula, but you need to do some math in Scratch. 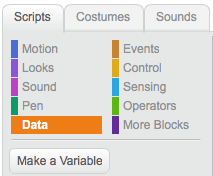 In the Operators menu, Scratch contains blocks that you can use to do arithmetic. You can place arithmetic blocks inside one another. When you do this, the operation in the innermost block will be performed first. In the expression below, the 2 and 4 will be added together first, and then the result will be multiplied by 10. What will be value of this expression be? 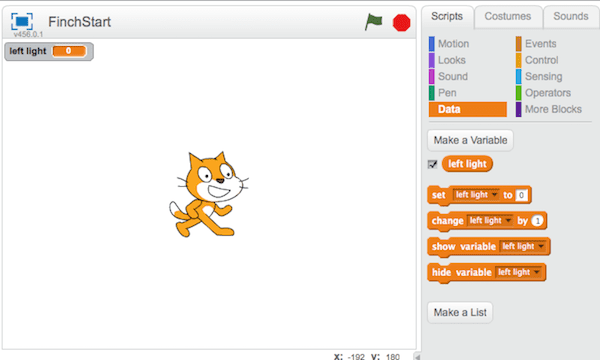 Make a hypothesis and then test it in Scratch. Remember, you can click on a block to find the value of the block. Fill in the blanks below to make your temperature variable hold the temperature in Fahrenheit measured by the Finch. 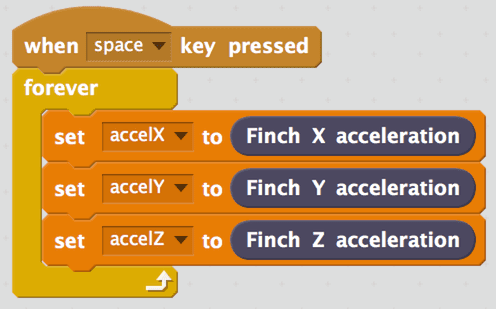 You can use the accelerometer to move a sprite around the stage in Scratch. This will enable you to make your own video games with the Finch as the controller! 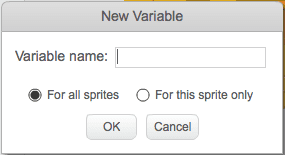 First, click on the small picture beside the text “New Sprite.” This will open Scratch’s Sprite Library window. Select a sprite you like and click OK. If you want to get rid of the cat, right-click on it and select delete. 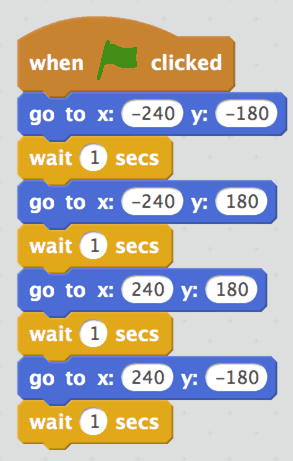 Sprite in Scratch move on a coordinate grid. You can see this grid by clicking the picture under “New backdrop:” by the Sprites area. All the way at the bottom is a background called “xy-grid.” Select it and click OK. Declare another variable named xPaddlePosition . You will use this variable to determine the x -position of the paddle on the stage. 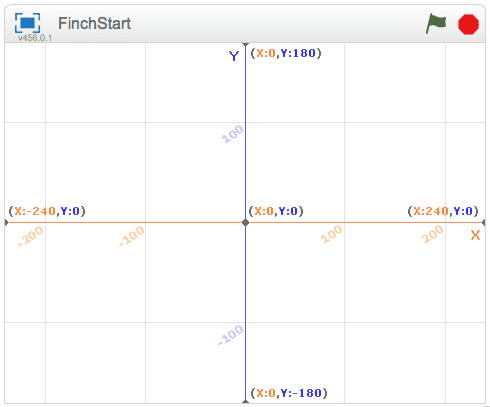 As you tilt the Finch, the value of the y -acceleration is between -1 and 1. What number will you need to put in the blank below to make the paddle move from -240 to 240? Place a go to block at the bottom of your forever loop. Use this block to continually set the x -position of the paddle sprite to xPaddlePosition . The y -coordinate for the sprite can be -180; this is the bottom of the stage. When you run your script, you should be able to move your sprite by tilting the Hummingbird!